Cliff Dwellers - Cougar is a piece of digital artwork by Carl Brenders which was uploaded on January 13th, 2010. 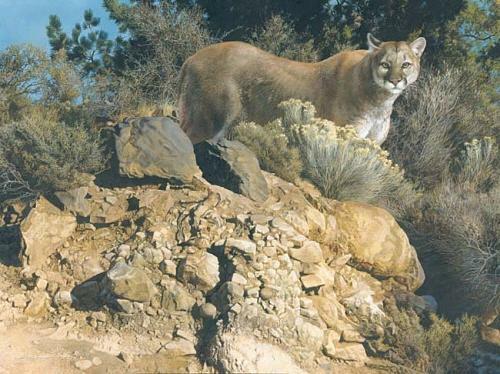 This big cat, on the cliff's edge, is beautifully rendered by the photo realism artist Carl Brenders, known for his depth of detail. You, the viewer, are there at this exact moment in time and are looking into the eyes of this Cougar. How thrilling... but you are safe, it is only a giclee canvas and not the real mountain lion. There are no comments for Cliff Dwellers - Cougar. Click here to post the first comment.